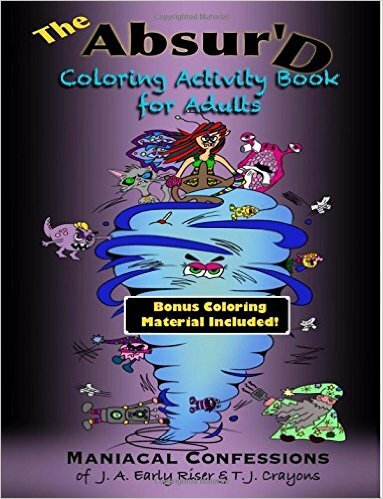 The Halloween Coloring Book by Penny Farthing Graphics contains quite a few scary and macabre designs. In contrast, Amanda’s Halloween book leans more toward trick-or-treat, candy, costumes, carved pumpkins, ghosts made from sheets, and humorous bats, cats, and spiders. There are a few slightly spooky designs, and even one very well-drawn spooky house and a chalice made from a hollowed-out skull, but nothing truly horrifying. Amanda’s hand-drawn designs are quite detailed, falling more toward the advanced side of the difficulty scale. Amanda herself describes them as “diabolically detailed” in her introduction! You’ll need your sharpest pencils and thinnest markers for most of the art. There are a few designs that are a bit simpler, but even for those you’ll need more than a beginner’s skill. Amanda even gives you a fun “pumpkin puzzle” mosaic design that allows you to choose how you want to “carve” the face out. You may want to make a couple copies of that design to try out different looks! As I’ve seen recently with several self-published coloring books, Amanda has also included a couple of extra pages at the back of the book. 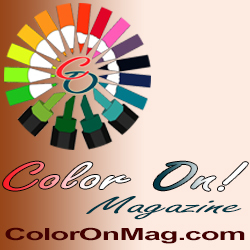 One is for you to use to test out your colors before using them on the designs. This is a great way to check how different markers might react with the book’s paper. The other sheet is intended for you to tear out and put between pages as you color, to prevent markers and other wet media from bleeding onto the next design. 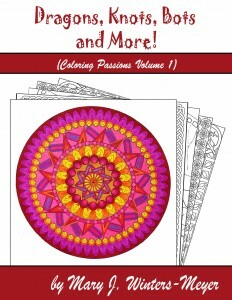 She’s actually created this page with a solid black rectangle in the design area, which should make it easy to spot among your other coloring pages.